I’m reading A Tuscan in the Kitchen by Pino Luongo whose description of making risotto comes in handy when you are at the stove and feeling rushed or wanting to cut corners. He says “When you make a risotto you should be in perfect harmony with yourself. You shouldn’t be nervous or angry. It’s a ritual that is going to give you so much pleasure later that it’s worth spending the fifteen or twenty minutes over a hot stove stirring very slowly. It can be like seducing a woman. She doesn’t know you, and you need to work things out with her slowly – meeting, flirting, getting to know each other, and wanting each other. It’s a dish of romance. If you rush it’s never good.” So take your time with this one and enjoy the fruits of your labour. You won’t be sorry. Heat a couple of big glugs of olive oil in the bottom of a heavy saucepan. Add chopped onion and saute until translucent and soft. Add garlic, saute for another minute or two. Then add arborio rice and saute with onions and garlic for about 2 -3 minutes until rice is coated in oil. Meanwhile, heat tomatoes and wine in a saucepan so they are hot and ready to be added to the risotto. There are a couple of important things to remember when making risotto: a) make sure your liquid ingredients are simmering away so they are hot when you add them, b) add the liquid slowly (just barely cover the rice each time you add the liquid and allow it to be fully absorbed before adding more), and c) stir a lot. So now with these tips in hand, add the tomato/wine mixture slowly and stir lots. 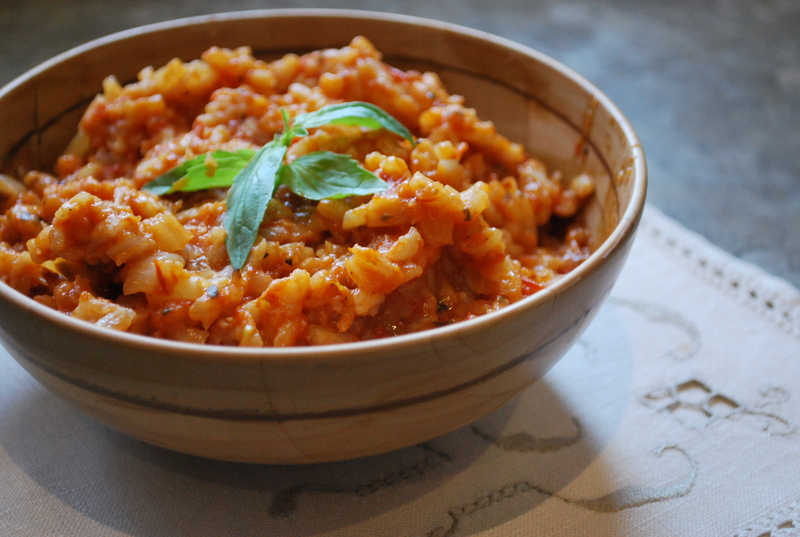 Once you’ve flirted and romanced the rice with the tomato and wine mixture (if you need more than what’s called for above, simply add a bit more wine, tomatoes, water, or stock) and it’s reached the perfect state of al dente-ness, add salt and pepper to taste and the chopped basil. Simple? Totally simple. Totally worth it. Totally perfect.